His recent self-titled CD combines the exotic breath of the alto and bass flutes with contemporary electronic vibe and touches of exotic folkloric instruments. His music reflects a myriad of influences, from jazz to down-tempo electronic grooves, from pop to folk, from Brazilian samba to Indian ragas. 70's pop hits as re-imagined by Brian Wilson and Esquivel. Co-produced with fellow instrumental wizard Jim Hoke, featuring musical contributions from Janis Ian, Richard Bennett, Brad Jones, Neil Rosengarden and others. His first solo recording, mixing a wide range of pop and world music styles; from techno fusion to afro-beat, reggae to smooth jazz. A co-production with Jim Hoke. Randy performs on woodwinds along with some of Nashville's finest instrumentalists, playing Hoke's Mingus-inspired jazz compositions. Manatee Waltz moves from blazing post-bop to serene spirituality. 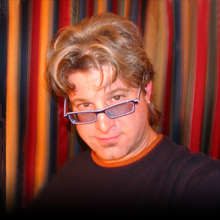 A co-production with Jim Hoke, Randy is featured on sax and vocals. Uptempo and humorous tunes, from originals to uptown swing standards. Also features vocalist Kristi Rose. Hoke & His Orchestra Bop!